Anyone who lived through that week probably never forgot it. Wildfires were driven by drought conditions and unbearable temperatures, with newspapers reporting some new calamity nearly every day. Thousands of acres burned in separate incidents around the Sonoma Valley and near Petaluma while a large block in downtown Napa was lost in a fast-moving blaze. And that was just the second week of July, 1913. The most dramatic of the fires happened as that week began. “Shortly before midnight the fire on Mount Tamalpais gained great headway approaching Mill Valley,” reported the wire service story that appeared in the Press Democrat on July 9. “[T]he flames are within half a mile of the city boundary. If the wind veers, Mill Valley and Larkspur are doomed.” Evacuation orders were issued for Mill Valley, Larkspur, Corte Madera and the little community called Escalle. The fire had started a day earlier and was not considered a serious threat; the cute little train that putted along the “Crookedest Railroad in the World” continued bringing guests to the hotel and the tavern near the peak of the mountain, one of the Bay Area’s top tourist attractions with panoramic views. There was little concern at first when visitors were told the train wouldn’t be running for a while because the flames were near the tracks but when the phone line went down and the fire could be seen from the porch, people began to panic. As the sun was about to set and guests were threatening to take their chances walking down the mountain, it was agreed they would try to get through on the train. With the passengers wrapped in wet sheets, the train slowly chugged down the rails with its many switchbacks, now less picturesque as trees burned on either side. The train car caught fire at least once. The engineer stopped and shouted he would no longer take responsibility for what happened and some passengers got off. “Windows cracked and broke,” according to a first-hand account that appeared in the San Francisco Call. “Sparks flew in through the broken windows and set fire to clothing. Slowly the train rolled through the banks of fire. Every minute seemed an hour.” Two women were unconscious when the train finally pulled into the Mill Valley station after dark. 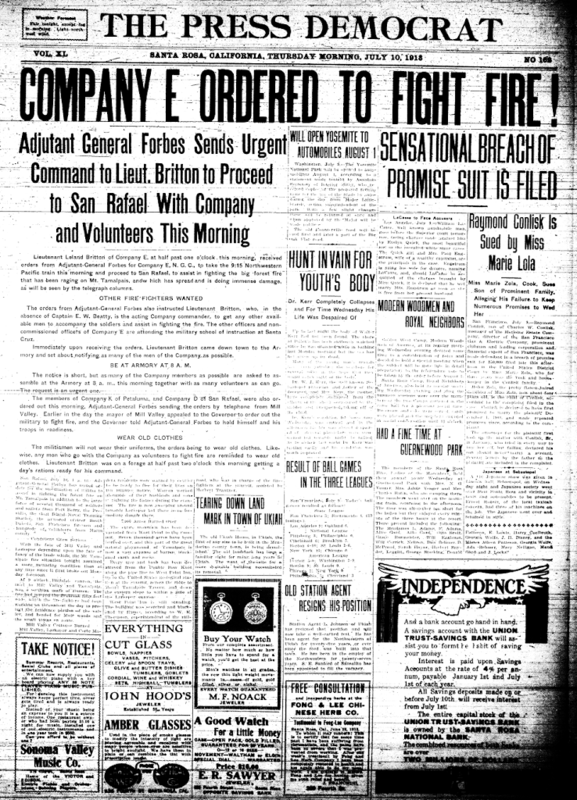 All Bay Area National Guard companies were mobilized, including Santa Rosa’s Company E as shown in the Press Democrat front page to the right. They joined 8,000 soldiers, sailors and firemen from San Francisco along with volunteers. Thankfully the winds calmed, but it still took them three days to beat out the fire using only simple hand tools and wet sacks. The Mt. Tamalpais fire wasn’t the only major disaster in the Bay Area that season. After it was well under control, Lt. Hilliard Comstock and some of the others from Company E were sent to Santa Cruz. They could well have spent weeks chasing regional fire threats. Nor was Tamalpais even the worst; in September about 80,000 acres burned in Napa County, cutting a swath from Lake Berryessa to the Delta – which at the time was the worst wildfire in California history, although now it doesn’t even rank in the top 20. It was also the summer that Jack London’s incredible Wolf House burned before he was able to sleep in it a single night. For Santa Rosans, the worst of the worst came on the afternoon of Friday, July 11. Everyone was probably breathing a sigh of relief because the morning Press Democrat reported the Tamalpais blaze was contained. Then at noon the fire bell sounded; two houses were aflame on lower Seventh street in the Italian neighborhood. The SRFD was able to save one house but the other was a complete loss. Afterwards, someone checked the city reservoir – and found that fighting those fires had drawn water levels dangerously low to just five feet. Nearly everyone in Santa Rosa ignored his plea. “A trip along one of the principal resident streets of the city Friday evening showed that in fourteen blocks there were but three houses in front of which the lawn was not being sprinkled,” the Republican grumbled. Those inclined to conspiracy theories apparently thought the mayor was crying wolf because water wagons were still hosing down the streets – essential because many people still used horses – and both papers had to explain the wagons didn’t use city water, instead sprinkling what the McDonald Water Company supplied from (what’s now known as) Lake Ralphine. But we shouldn’t judge the water wasters too harshly. July 11 was also remarkable for setting the all-time record for the hottest day in Santa Rosa history – 113 degrees at one o’clock, with 126 recorded in direct sun (see historical temperatures). It was hotter in Santa Rosa than Phoenix (110) or Fresno (108). Because of the scorching heat the Petaluma Argus reported hundreds of chickens died; any apples hanging on the south and west side of trees turned brown. The heat wave passed but by the end of the month Santa Rosa enacted emergency water measures, as seen in the notice shown here. It was a throwback to the water rationing prior to 1907 discussed in the link above, except then the borderlines were east/west of Mendocino avenue with watering allowed every day at different times. The new edict was north/south of Fourth street on alternating days which was ever so much better because. Everyone was allowed to go nuts with their hoses on Sunday nights and a few neighbors probably even had water fights, wasteful though they be. This statement was made in the office of the REPUBLICAN today by Mayor J. L. Mercier, directly after his return from the noonday blaze on Seventh street. The situation became apparent when water was needed to fight the blaze to which the department had been summoned. “The reservoir was practically empty at the close of the day yesterday and after the pumps had worked all night there was but 5 feet of depth in our 15 foot reservoir. The mayor wished the REPUBLICAN to inform the people of the facts and beg them in their own interests–for their own protection to USE NO WATER FOR IRRIGATION PURPOSES until Monday at the earliest and to be as sparing in the use for domestic purposes as possible until a full reservoir shall give the property of the citizens the protection of a supply for possible use at fires. Santa Rosa is not the only city thus situated. Stringent rules have been proclaimed in many California cities and in others citizens have been warned and cautioned–are continued daily. Your home may be lost if water is squandered in careless domestic use, and, more especially if it is wasted in trying to save a few lawns. It is up to the citizens and theirs will be the responsibility if serious trouble results from a neglect of this warning. The “oldest resident” with his record of long ago hot spells was not around today, or if he was visible nobody met him. Thursday, July 10th, was the “hottest day,” with a maximum of 105, but this day, the 11th, at 11 A. M. the small god with the winged heels flew up to 107 degrees above zero. This is the registration of the big mercury machine of Lawson & Rinner on Fourth street, and while the peculiar position of the recording instrument may add two degrees over the government reading, this is the correct heat record on Fourth street, Santa Rosa. Today is the fourth transit of the mercury across the 100 line in this locality this year…The official maximum reported for Friday by the weather observer was 111 1-2 in the shade. In the sun 126 1-2. Property owners of the city who use the city water were very slow to respond to the urgent warning given out Friday by Mayor Mercier concerning the sprinkling of lawns and the general wasting of water. People in general do not seem to appreciate the seriousness of the situation. There is more water available today (Saturday) than there has been for the past two days, but the danger line is not passed by any means, and the city may face a water scarcity that will be of a lasting nature unless the citizens are willing to co-operate with the authorities in the matter of conserving the supply. This is not the truth as the city is buying water used on the streets from the McDonald company and is spending money to keep the streets in fair condition and the dust partly laid, that the comfort of the people may not be lacking. If, on the other hand the citizens will show as much consideration for themselves in refraining from the useless waste of water at a time when danger threatens, the famine will easily be avoided. A trip along one of the principal resident streets of the city Friday evening showed that in fourteen blocks there were but three houses in front of which the lawn was not being sprinkled. As Mayor Mercier tersely expressed it, “Rather your lawn burn than your house.” A few days of rest and the thirsty lawns may drink again and in the meantime the people may sleep more securely in the knowledge that the fire pressure will defend their homes. WOULD YOU LIKE TO BE ICEMAN? Grace Brothers ice plant at the brewery has been having a heavy run the past week. Business has been brisk at the brewery itself. Owing in the warm weather beginning the Fourth, there has been a steady increasing demand for ice from all parts of town and the ice man has been unable to keep up with the demand. For several days past many people have been going to the ice plant personally and securing what ice they wanted and carrying it away. Yesterday the place was fairly thronged and several men were engaged in getting out the ice and waiting on customers. At 1 o’clock there was a long string of people lined up waiting their turn and no less than five men waiting on them. Yet the line was constantly lengthening. Many came in autos and buggies carrying 50 to 100 pounds each, while others on bicycles and afoot took 5 to 25 pounds in sacks or wrapped in paper. Busted! The city phoned last week to inform us we were violating Santa Rosa’s mandatory water-use restrictions – we were spotted using sprinklers during the day. After hanging up, I searched out the city’s drought web page. Sure enough, the new rules are “outdoor irrigation must occur between 8pm and 6am.” We did not know that and have adjusted watering accordingly. The unsettling part of this incident was concern a neighbor might have snitched instead of speaking with us directly, but the water dept. staffer who called – and who undoubtedly has the only civic job more thankless than parking enforcement – said the report came from someone “with the city.” Looking at the drought web page again, I found “water watch patrols, performed by city staff, are actively looking for water wasting behaviors.” Good Lord, it’s the return of the Water Police of yesteryear – one of the most peculiar episodes in Santa Rosa’s history a century ago. Before getting into that topic, however, let’s look at some of the things said about our current situation. AVERAGE RAINFALL Santa Rosa gets an average of about 30 inches of rain per season – give or take an inch or so, depending on where you are. Bennett Valley is different from downtown is different from Fountaingrove. While this makes “average rainfall” a bit of a fuzzy target, you can add up all the numbers claiming to represent “Santa Rosa” going back a century and come up with 30.36 inches. (Inexplicably, a search of Press Democrat articles over the last few years finds the paper variously claiming the average is between 31 and 40 inches, consistently skewed to the high side.) 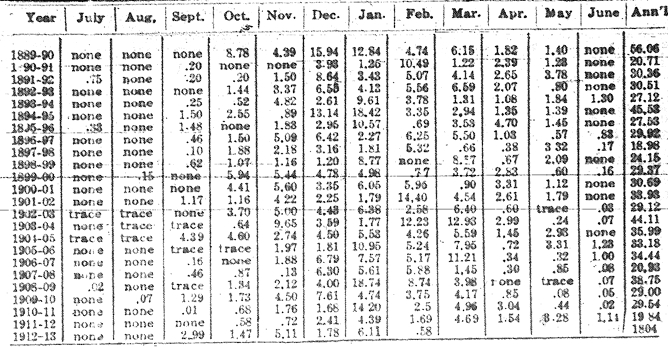 Historical data shows a standard deviation of 9.15, so a year with 21 inches of rain would be considered low-normal. ANNUAL VS. SEASON Not so vague is the definition of our rainy season; like most of the state, our “water year” is July through June. It makes no sense at all to discuss rainfall in terms of a calendar year, yet many resources – including Santa Rosa’s current Wikipedia page – can be found using calendar year totals. On the city web page linked above, it’s claimed “In 2013, Santa Rosa received less than 6 inches of rainfall.” That’s an alarmist statement and badly misleading; in the 2013-2014 water year, the total was nearly three times that. MISSING HISTORY Any discussion of “average” rainfall should come with the caveat that there are serious gaps in the historical record. In the Santa Rosa rain data between 1903-2010 (LINK) there are months incomplete or missing, and much of the data between 1916 and 1925 appear untrustworthy; move back to the 19th century and there are entire years either blank or have just overall county summaries. There’s a (surprisingly interesting) paper on the history of Sonoma County weather stations that discusses the various old records. The Press Democrat occasionally printed the readings going back to 1889, as seen in the illustration below. Recent measurements can be found from UC Extension and many places elsewhere. DROUGHT Is Santa Rosa currently in a drought? Yes, absolutely – a drought is two or more consecutive dry water years, and this is the fourth we have floated near the bottom of the low-normal range, with 2013-2014 way down at an abnormal 17.91 inches. The situation’s not good, but not nearly as dire as many other parts of the state. Through the end of May our 2014-2015 year stands at borderline-abnormal 20.65 inches. This is probably Santa Rosa’s third worst drought since statehood (see above, re: missing history). Over the two water years of 1862-1864 there was only 29 inches combined, and about the same during the 1975-1977 pair. Santa Rosa’s water situation was far worse at the turn of the last century, but not because of drought. I’ve written up various parts of that story in posts that can be found in the archives, and am shamelessly plagiarizing myself herewith. Links back to the original pieces appear at the end. Although Santa Rosa was surrounded on all sides by fresh water (river, laguna, aquifer, even large creeks running through the center of town), the stuff that came out of the faucet more than a century ago was always somewhat foul and sometimes scarce. Part of the problem stemmed from the town having both privately owned and public water utilities with separate pipes running down all the main streets. The water pipes for the private system belonged to the old Santa Rosa Water Works, better known as the McDonald Water Company, which had been operating since the mid-1870s. Water from the McDonald system was “soft” and considered good tasting, even though an 1891 report confirmed suspicions that its reservoir, Lake Ralphine, was contaminated with hog and human waste (maybe it was E.coli that gave the water its je ne sais quoi). The municipal system came along in 1896 and was also plagued with problems from the start. City water was unmetered and free, but “hard” and tasted of sulphur. Still, they couldn’t keep up with demand because there weren’t enough wells and the steam engine pumps were underpowered. Even with the addition of a 1903 well that nearly doubled capacity, the city’s pipes were always at risk of running dry and a report the next year explained why: Almost a quarter of the water leaving the reservoir was lost somewhere in broken plumbing – 270,000 gallons just dribbled away every day. Caught in the middle between these two “just good enough” companies was the public, stuck with choosing between bad and worse. The McDonald system had no incentive to upgrade its service while the city water works had trouble raising bond money for improvements as long as there was a competitor in the private sector. And it surely did not help that at a 1906 City Council meeting Thomas J. Geary was wobbling between jobs as city attorney and lawyer for the McDonald water system, where he argued that the city water works should be shut down. Along the way, Geary also told the Council the rich were entitled to more water than Average Joe because they paid more taxes. Santa Rosa’s water system was such a mess the town enacted severe conservation measures. Policemen, firemen and city inspectors became the Water Police, empowered to wake you in the middle of the night if someone heard water running. A city inspector was hired to examine toilets, faucets, and other fixtures for leaks, and had powers to issue a $2.50 fine – equal to a few days’ pay for the average worker – for each violation. There was also a monthly fee for every water fixture in your home; it’ll be 25¢ per month for the pleasure of that bathtub in your house and having an indoor toilet cost another quarter (and worth every penny). Water Police assessed extra charges for nearly everything; watering your lawn cost 1/2 cent per square yard per year, irrigating strawberries and vegetables, 3¢ per square yard. And then there was the nutty Pavlovian alert system. Lawns and gardens could be watered only at certain times and/or certain days depending whether you lived east or west of Mendocino Avenue; in the scheme used following the earthquake, the east side could use a garden hose between 4 and 8 o’clock, while westerners had the hours between 5 and 9. Starting and stopping times were announced by the Grace Brothers Brewery steam whistle which also sounded to announce lunch time and quitting time. If you’re keeping track, all that meant the brewery whistle was sounding at 12, 4, 5, 8, and 9. When that whistle blew I imagine people often just stood still for a moment with their heads cocked, like puzzled dogs, trying to figure out if they were supposed to eat, start, turn off or go home. Santa Rosa introduced water meters in 1905 with the promise that a family of five or less still could have 350 gallons of free water a day. But old habits die hard and the town kept the Water Police around at least through 1907, when the reservoir was finally patched and covered, a new well drilled, and high powered electric pumps replaced the antique steam engines. Street repairs after the earthquake also fixed many of those leaky pipes. But water woes continued, now because the town screwed up installation of the new meters. In one outrageous SNAFU, it was revealed that five businesses – including a bakery and one of Santa Rosa’s largest saloons – were connected through a water meter for a private residence. The homeowner understandably refused to pay the excess-use water bill so the city shut off the meter, and thus the water supply to the home and businesses alike. Two of the businesses agreed to pay the flat business rate, but the others balked, leaving the water turned off. “Without the necessary water, sinks and toilets go without flushing and the neighbors are wondering ‘how about the sanitary condition’ of the block,” commented a letter to the editor. After a week without toilets or tap water, about a dozen delinquent businesses paid their bills. At least one major property owner thumbed his nose at the city system and signed with McDonald. But Santa Rosa’s intractable policies placed still other companies in a Catch-22. Most buildings had only a single water hookup, yet there could be more than one business at that address. Under city rules, all water was shut off to the building if any of the businesses there were past due. One company caught in the middle was the main downtown grocery store: Erwin Brothers, at 703-705 Fourth street. They went to city hall to pay every cent in arrears and make a deposit toward future payments but the city refused to accept their money – there was another tenant in the building who still didn’t want to pay. After nine dry days, the Erwins illegally turned the water on themselves and filed an injunction against the city to keep it on. What happened next probably had the town buzzing. According to comments from the Erwins published in the Republican, the mayor personally asked them to drop the lawsuit, suggesting, “Why don’t you connect with the McDonald system and save all this trouble,” foolishly placing Santa Rosa in legal peril, given they were litigants against the city over this very issue. The mayor claimed none of that was true and he hadn’t even spoken with them; the Erwins countered with details of the visit, including the mayor had left his kid waiting in the buggy. The suit was dismissed a couple of weeks later and the business hookup rules fixed, bringing to an end over a decade of various skirmishes in the Santa Rosa Water Wars. For years the city still had two water systems – the McDonald Water Company continued to operate through the Roaring Twenties. The city eventually simplified rates so residents were no longer paying different prices to water their watermelons and flowers. But city water still was hard and sulphurous, so on warm summer afternoons the sprinklers danced wild over Santa Rosa lawns with a golden spray and a faint stench of eggs gone rotten. Heaven knows that Santa Rosa loves to toot that it’s “business friendly,” and was ever thus. But in 1909 the town provoked a nasty little feud with downtown businesses that ended with a lawsuit and the Mayor trading accusations of lying with one of the top Fourth street merchants. The cause of everyone’s discontent was the city water billing system. As described here earlier, Santa Rosa had a crazyquilt rate scheme that could only be described as insane. It was 25¢ a month to have a bathtub and 3¢ to water a square yard of “vegetables and strawberries,” but only .0025¢ if you aimed the garden hose at the same-sized patch of flowers or lawn. A liquor store owed $2 a month, but a dentist paid only a dollar above the base rate, and physicians paid nothing. To help break the impasse, the Chamber of Commerce held a public hearing that recommended the water be turned back on at once. But in a statement published on the front page of the Press Democrat, the mayor offered nothing in the way of compromise, appealing only for everyone to pay up. “You have invested a large amount of money in your water system,” Mayor Gray wrote. “The plant is a fine one. There is plenty of water, and it is served at high pressure, reaching the upper stories in summer as well as in winter. As a matter of public spirit, I appeal to all who have not done so to comply with the law…” The only alternatives discussed were unworkable: Dig up the streets and install individual connections, or deputize landlords to calculate bills for their tenants according to the nutsy type-of-business-plus usage formula. After a week without toilets or tap water, about a dozen delinquent businesses paid their bills. At least one major property owner thumbed his nose at the city system and signed with the McDonald Water Company. * But Santa Rosa’s intractable policies placed still other companies in a Catch-22. Most buildings had only a single water hookup, yet there could be more than one business at that address. Under city rules, all water was shut off to the building if any of the businesses there were scofflaws. One company caught in the middle was the main downtown grocery store: Erwin Brothers, at 703-705 Fourth street (next to today’s Arrigoni’s Cafe). Although the Erwins had stopped paying their water bills after learning that few downtown businesses were in compliance, no one could fault their earnest efforts to resolve the situation in the week of the water shutoff. They lobbied the mayor and city councilmen and walked Fourth street asking business owners to sign a petition requesting the city switch billing to their landlords. They went to city hall to pay every cent in arrears and make a deposit toward future payments. But the city refused to accept their money – there was another tenant in the building who still didn’t want to pay. After nine dry days, the Erwins illegally turned the water on themselves, and filed an injunction against the city to keep it on. What happened next probably kept the town buzzing for weeks. According to comments from the Erwins published in the Republican, Mayor Gray personally asked them to drop the lawsuit, which would be expensive for the city to defend. He then reportedly said, “Why don’t you connect with the McDonald system and save all this trouble. You are trying to defeat the very plans you have suggested to the council and are working for.” Gray immediately responded via the Press Democrat that he wouldn’t have said such a thing and implying that he hadn’t spoken to the Erwins at all. The grocers countered with their own statement in the Republican, noting even the time the mayor dropped by and including the detail that Gray left his kid waiting in the buggy. * As discussed here before, Santa Rosa had both public and private water systems available in most of the town. The three-decade old McDonald Water Company notoriously had low water pressure and sanitation problems (the water came from Lake Ralphine, which should explain enough). The city water came from deep wells, but was often said to taste and smell foul (MORE). While the city installed meters that billed for how much smelly water was used, the McDonald system offered all the sickening water you could dribble out of the spigot at a flat monthly price. Street Commissioner W. A. Nichols was busy Monday turning off the water from all business houses on Fourth street where the water rates had not been paid according to the water ordinances. While the step had been anticipated on account of the recent order of the City Council, some of those unprepared for the enforcement of the same were wrathy, but the only remedy was to pay the water bill and then the Street Commissioner had the water turned on again. The turning off of the water is the outgrowth of the refusal of tenants to pay for water used for other than “domestic” purposes. All attempts to collect were met with either flat refusals or else with excuses to delay the day of settlement. A very few people in the district have paid regularly, but others had not, and the city was getting nothing for the water. The shutting off of the water in some cases worked hardships on innocent parties, as for instance, where one tenant in a building had refused or failed to pay the water was shut off the same as where all had refused to settle. The advice of City Attorney A. B. Ware was to the effect that property owners who had constructed buildings with only one tapping were responsible for the tenants as they had been informed that separate connections should be put in for each separate tenant. As it was the first general move to enforce the terms of the ordinance in the business section no charge was made for turning the water on again but in all cases a settlement was forced and repetition of the offense will cost the offender $5 to again secure water. In some cases the city water was given up and the pipes of the Santa Rosa Water Company were connected, but even then the property owners or tenants will be forced to pay the same rate the city asks, as well as pay their share of the taxes going to maintain the municipal system. Some attorneys say that where a tenant has paid his water bill the city may be subject to a damage suit where the water is turned off to keep others from getting water. They hold that it is up to the city to provide separate means of cutting the water off without interfering with those patrons who do pay. City Attorney Ware declares it is a matter for the tenant and owner alone to settle. While the much discussed turning off of the water in a number of the buildings in the business section on Monday, was brought up at the Council meeting last night and discussed again, the matter was left where it is and was without changes. Mayor Gray asked whether the Council could not construe the meaning of “domestic” in the light that business houses could be give water free for drinking and toilet purposes, and those who use it for commercial purposes, such as hotels, lodging houses, saloons, druggists, doctors and dentists, etc., pay for the same, thus stopping the tearing up of Fourth street and the losing of patrons to the other company. This was his solution of the problem. City Attorney Allison B. Ware, who has previously upheld the water ordinance, did so again, and advised that any changes in the same should be taken up very carefully. He suggested that the main trouble in the present controversy was that its requirements had not been enforced from the first. It would have avoided considerable trouble and the piling up of a large bill. Several Councilmen concurred in this conclusion of the City Attorney. In the matter of tearing up of the street it was replied that corporations should be compelled to put the streets back in the same condition in which they found them. Mayor Gray advocated, in order to prevent the working of hardships on people, who had paid their water bills, in the same buildings with those who had not, with the result that the water was turned off, that separate stopcocks could be placed so as to reach the proper parties. The Ordinance Committee may endeavor to reach a satisfactory adjustment of the vexed question. A mass meeting of citizens. business and property owners was held on Wednesday night at the Chamber of Commerce to consider the situation created by the action of the City Council in turning off the water along Fourth street where consumers had neglected or refused to pay their bills. The situation is a peculiar one by reason of the fact that in many instanced of turning off of the water has alike affected those who have paid and those who have not. As a rule, each building is connected with the city mains by a single tapping and no means has been provided for turning off the supply of any individual consumer. When the order went forth to cut off those who had failed to pay it affected both the just and unjust.” For the last few days block after block on Fourth street has been without water. By request, President E. L. Finley of the Chamber of Commerce called the meeting to order. Organization by perfected by electing Charles O. Dunbar chairman and Edward H. Brown secretary. In his opening remarks Chairman Dunbar spoke of the necessity of finding some solution for the problem with which the business portion of the city is at present confronted, and urged that all get together and work for the best interests of the community. Dr. N. Juell outlined the existing situation at length, incidentally pointing out the fact that many were being solicited to become customers of the McDonald system, and that every customer lost meant a loss of revenue to the municipality. He said he thought many who have not paid would have done so had a collector been sent around, the failure to liquidate being in many instances merely the result of carelessness or oversight. Fred J. Bertolani said that in many cases it was not the fault of the property owners that the buildings were not supplied with more than one tapping, citing instances where he had attempted to secure individual tappings for some of the Shea buildings without result. He did not regard the plan of trying to provide individual tappings at the present time as practical, as it would entail too much trouble and expense. William R. Carithers thought that the thing to do was to get the water turned on, and said he had made a proposition to the city authorities to pay the water rent of all tenants in the Carithers building from the 1st of March provided the back bills would be wiped out. He said he did this for the protection of those tenants who had paid, and that in the event of his proposition being accepted, he of course expected to charge the amount so expended back to the renters. Councilman Fred J. Forgett was called upon, but replied that he was present merely as an interested spectator anxious to see whether any feasible solution of the problem would be suggested. S. P. Erwin said he had spoken to the Mayor and several of the Councilmen regarding the situation, and all seemed to be fair and have no other desire than to do their duty and protect the interests of the municipality. He believed public necessity demanded that some way be found to have the water turned on, and favored having the landlords pay the bills and charge the amount back to the tenants. He thought that perhaps the City might be willing to rebate the back bills in event of such a plan as that mentioned being adopted. William Sukalle thought the entire idea of free water was wrong, because his experience had shown him that visitors looking for property investments do not regard it as “good business.” He recited an instance where a friend of his had come here with $12,000, but on account of the tax rate and the fact that some people were being compelled to pay in order that others might get something for nothing, went away and took his twelve thousand with him. Wirt E. Rushing said that it was very apparent, judging from the remarks of the speakers who had preceded him, that the sentiment of the meeting was friendly to the City, and that while he had heard talk on the street about bringing suit, etc., such a course would only mean multiplying the troubles of the municipality. He also referred to the unnecessary tearing up of the streets that would result in case of any general move to change over to any other system, pointed out the fact that a loss of public revenue in one place would merely necessitate raising the amount somewhere else, and suggested that everybody pay up and start again fresh with a clean sheet. Tom Gregory thought it would be childish to go to the authorities and promise to “be good” in future if past sins should be forgiven. Referring to the remarks made by a previous speaker, he ridiculed the idea that the non-paying consumers had failed to settle through mere oversight or carelessness. “They did not pay because they thought they would not have to pay,” he said. “We go to the Gas Company’s office and settle up every month without a whimper, having found out that is the only way to keep the light from being turned off.” He did not think the employment of a collector was necessary. After a good deal more of this kind [illegible microfilm] …the meeting then adjourned, and the discussion resumed on the sidewalk outside. The movement against paying for water for business purposes appears to have been at least partially checked. On Monday a number paid up and Street Commissioner W. A. Nichols had the pleasure of turning on the water for four buildings representing some eleven business houses, while four other persons requested him to call Tuesday morning at eight o’clock and receive his money and turn on the water for their properties. The Con Shea buildings, including the Elks’ hall and business houses on B street, a Main street building, and a building on lower Fourth street, were among those who paid up and are again supplied with city water. It is believed that now that the ice is broken and the matter is better understood that the opposition will melt away. The sums collected Monday represented bills ranging from $9 to $20 each. When the ordinance was first passed by the council making a charge of one dollar a month to business houses, we paid our dues and continued to do so until we found the majority of the consumers were not paying, then we quit, telling the street and water superintendent that as soon as the question was settled we would gladly act accordingly. There the matter rested until last week, when the water was turned off. After waiting a day or two without water, our Mr. S. P. Erwin spent almost an entire day interviewing the council and the mayor to see if some arrangements could not be made whereby the water could be turned on to all consumers and the matter adjusted. Following that a meeting was called, to be held a the rooms of the Chamber of Commerce, and there a committee was appointed, of which our Mr. S. P. Erwin was a member to interview the property owners along Fourth street, asking them to sign a petition requesting the mayor and council to pass a resolution making the water charge against the property owners rather than the tenant. In that way it could be added to the rent and collected with it, thereby preventing one tenant by refusing to pay having the water shut off the entire building, as at present. This petition was signed by every property owner but one that was approached–a few being out of the city or not in when called on–and was handed to the mayor, with the request that some immediate action be taken, as the business interests were greatly suffering, and got the council together, hoping something would be done, but nothing came of the efforts. Finding ourselves still without water and our business interests suffering, Mr. S. P. Erwin went to the city clerk and tendered him all back dues, together with any costs for turning on and dues in advance, and who, on account of another tenant in the building still being in arrears, refused to take the money or allow us the use of the water. Thereupon he was informed that we would turn it on ouorselves, which we immediately did, and then enjoined the city from turning it off. We have never resisted the water assessment, only holding in abeyance the payment until the matter was adjusted. We have suggested that the water be turned on to all and a civil suit begun against some party in arrears for the collection of dues, and if the ordinance was found valid, there is no question but all would pay at once and continue to pay. But instead the council have elected to make it the most exasperating possible and inconvenience all for the refusal of a few. After offering to pay and being refused water, we turned it on and then got out papers enjoining the city from turning it off. And there we rest our case, claiming the use of the water, especially when we are now and have at all times been willing to pay for it. We are not fighting the interests of the city. We want to use the city water and pay our dollar per month into the city treasury rather than follow the mayor’s advice. Mayor Gray came to us and urged us to connect with the McDonald system and cancel proceedings. We told him that we were property owners and tax payers and did not want to pay $12.00 per year into the McDonald Water Company when it would do the city no good. As we had to pay our proportion of the city taxes, we wanted the money to go to the city. And, again, if his advice were given to all and they should elect to follow, what would be the condition of Fourth street after being cross sectioned every 20 to 40 feet. It is certainly bad advice for the mayor to give to the citizens, but presume he thinks it an easier solution of the question. We are not fighting the interests of the city, but this seems to us the only way to get some kind of a discussion, so that all would understand and the question be permanently settled. Mayor James H. Gray last night issued an official statement denying the assertion made by Erwin Brothers in an afternoon paper to the affect that he (Mayor Gray) had come to them and urged that they connect with the McDonald system and cancel their proceedings against the city, etc. The Mayor emphatically says he did no such thing. His statement appears in another column. The various members of the City Council, as well as City Attorney Ware and Street Commissioner Nichols, also stated last night that in all his conversations with them, both in private and at the Council meetings, Mayor Gray has taken a position exactly opposite to that charged by Erwin Bros. and has constantly urged that some speedy action be taken that would prevent the general tearing up of the streets and loss of consumers to the city. Mayor Gray is also on record regarding the matter, a public proclamation dealing with the subject having been issued last Saturday and published in both papers. In this proclamation he took the same position the members of the Council all say has been his position from the first. The communication from Erwin Brothers follows their injunction suit against the City, the Mayor and Common Council, together with the other officials being named in the complaint as representatives of the municipality. The law makes it incumbent upon the City authorities to turn off the water in all cases where consumers neglect or refuse to pay their water bills, and there is no alternative. It is against the law for any private party to turn on the water without written permissions, after it has been turned off by the Street Commissioner. Because some others had done so, Erwin Brothers allowed their water rent to get badly in arrears, and finally tendered the amount due with the request that the water be turned on at once. Other consumers also in arrears were being served through the same tapping, and consequently it was impossible to comply with the request, so the tendered payment was not accepted by the City. Thereupon S. P. Erwin personally turned on the water that the City authorities had ordered turned off, the firm’s attorneys at the same hour serving injunction papers, which had been previously prepared, asking that the municipality be permanently restrained from again disconnecting the tapping leading to the Savage building, in which the Erwins are tenants. The sentiment was generally expressed upon the streets last night that, having precipitated the suit, the proper place for Erwin Brothers to define their position is in the courts. The probabilities are that the suit will be a long and expensive one for the municipality. Mayor Gray and the members of the City Council had a conference on the water question last night…City Attorney Ware again defined and reiterated his position upholding the water ordinance. He also cited definitions of the term “domestic” from some of the best authorities. The statement of Erwin Bros. in this evening’s Republican that I urged them to connect with the McDonald water system, is incorrect, and is exactly contrary to what I did urge them to do. I have requested and urged to the utmost of my power, all consumers of water to use from the municipal water system. I refer to the statement published over my signature, both in the Press Democrat and the Evening Republican, which expressed by [sic] views exactly at all times. Mayor Gray makes a statement in the Press Democrat denying that he asked us to connect with the McDonald water system. Mayor Gray, accompanied by his son, drove up to our store between 3 and 4 o’clock. Mr. Gray came into the store, his son remaining in front in the buggy. Mr. S. P. Erwin met him in front of the store and they were in conversation ten or fifteen minutes. These may not be the exact words as passed between Mr. Gray and Mr. Erwin, but they are absolutely correct as to the meaning, and the “Why not connect with the McDonald water system and save trouble” is absolutely correct. There were no witnesses to the conversation, except as to passing back and forth, but we are willing to leave it up to the people. We have no fight against the city or any of its ordinances. This was started without malice or feeling, simply to force a settlement of the water question rather than to let it drag for weeks. We went to the clerk again yesterday and asked to pay our water dues, but under the advice of the city attorney he refused to accept them. We are willing now, and always have been, to pay for the water used. We told Mr. Nichols when we quit paying that we did not want our water turned off, but did not feel like paying if the balance did not, and asked him to come to us and let us know before turning it off, which he said he would do, and we would pay it. After it had been turned off we asked him why he had not come as agreed. He said we had been notified through the papers and he supposed we had seen it. We do not blame Mr. Nichols for this, as he was doing his duty as advised, but are merely stating our case. John McCormack of San Francisco, owner of the McCormack building on the corner of Fifth and B streets, is in Santa Rosa today, arranging to disconnect his building with the city water system and to get it into communication with the McDonald Water Company. The seven firms doing business in his building had been urging him to do something to obviate the drouth prevailing there, and so he came up in person, and after investigating, decided to make the change of water systems. Mr. McCormack has had few opportunities to visit his business interests here and he declares Santa Rosa looks like a place with a future. He left this afternoon for the metropolis.